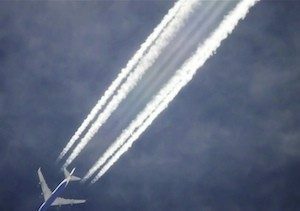 WIth almost no exceptions, the entire climate science community is completely denying the blatantly obvious and verifiable geoengineering reality. The all out aerosol spraying of skies around the globe is absolutely inarguable and yet the climate scientists/meteorologists are still pretending geoengineering is only a "proposal". How can we explain the total denial of this reality coming from climate scientists? They fit into one of these categories, they are either completely unqualified for the job they hold, afraid to speak out, willing to lie to protect a paycheck and a pension, or they are clinically blind. None of these reasons are justification for the total deception being fed to us from the so called "experts" that are entrusted with the public welfare. We have long since lived in an Orwellian world but now it has reached a point that is difficult to even comprehend. Articles like the one below are laden with direct lies and lies of omission. They try to paint the picture that a small fleet of jets spraying aerosols into the atmosphere could cool the planet. That the only thing we need to worry about is who will control the thermostat. After 65 years of geoengineering on an ever larger scale, now involving what is likely thousands of jets, with a planet that is rapidly descending into total meltdown, we can say with total certainty solar radiation management is only making a bad climate situation far worse. Virtually none of the known unavoidable major negative consequences of SRM are even mentioned in most mainstream articles. Total disruption of the hydrological cycle, shredded ozone layer, lack of direct sunlight, and what is never ever mentioned is the fact that what goes up, must come down. Virtually the entire surface of the planet is being systematically contaminated, as is every single breath we take. How is it that this last and most dire point is never mentioned in any mainstream media articles or even in the science studies about aerosol geoengineering? Are we to think that thousands of climate scientists cannot comprehend this fact? That something sprayed into the atmosphere must settle down to Earth? Most of the climate science community should be viewed with contempt for their part in this greatest of all human crimes. Once the public is fully aware of what has been done to them, legal action should be immediately taken against all those that willfully participated in the completely illegal climate engineering assault, or in the criminal attempt to cover up these lethal programs. Make your voice heard in this battle. This does not mean to simply complain, but to help wake others up by passing on credible data on the climate engineering issue.